Spend the day exploring the fascinating Kennedy Space Center Visitor Complex, just 45 minutes from Orlando. Learn about the history of the US space program and watch stunning IMAX films. 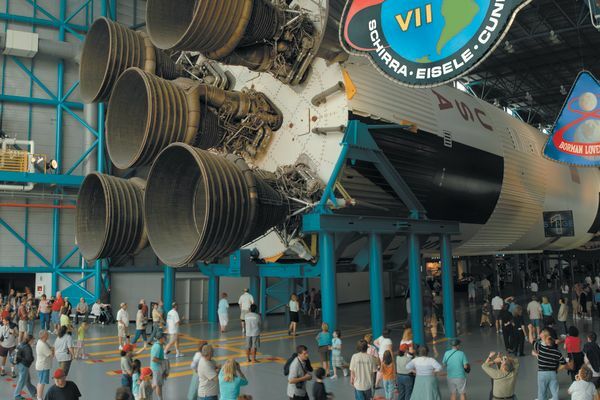 Don't miss the chance to walk under a Saturn V rocket, get a close-up view of the Space Shuttle launch pad, try your skills in a shuttle simulator, and experience a virtual moonwalk! Kennedy Space Center Visitor Complex is an out of this world destination not to be missed. 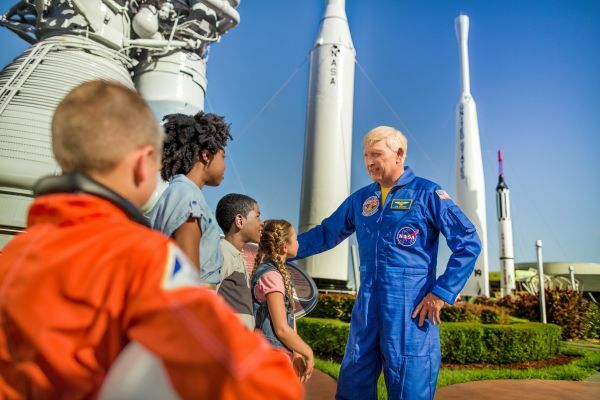 NASA’s launch and landing HQ promises a day of fun and a lifetime of inspiration as you tour launch areas, meet a real astronaut, walk beneath a massive moon rocket, launch aboard the Shuttle Launch Experience and even view a live rocket launch. Less than one hour from Orlando is NASA’s launch headquarters – the Kennedy Space Center (KSC). The Kennedy Space Center Visitor Complex offers a fascinating, behind-the-scenes look at the U.S. space program. Space Shuttle Atlantis and Heroes and Legends – NOW OPEN AND INCLUDED AT NO EXTRA CHARGE! The world’s most comprehensive attraction devoted to the space shuttle, the Kennedy Space Center Visitor Complex’s new Space Shuttle Atlantis display brings visitors nose-to-nose with the priceless Atlantis spacecraft as only astronauts have seen it before – with payload bay doors open as if it were floating in space. More than 60 interactive touchscreen experiences and high-tech simulators invite guests to “be the astronaut,” bringing to life the people, passion, and patriotism behind NASA’s 30-year Space Shuttle program. Witness the dazzling complexity of the engineering marvel that launched the Hubble Space Telescope and built the International Space Station (ISS). You will receive an email 24 hrs prior to the travel date with your gate ready barcode tickets. Upon arrival to Kennedy Space Center Visitor complex, bypass the Ticket Plaza and present your tickets at the turnstile. What if I am not able to use the tickets on the travel date? Your gate ready barcode tickets are valid for 6 months from the issue date listed on the tickets.